Turbo Turf’s HS-500-ZX is likely the best performing Jet Agitated hydroseeder unit made today. 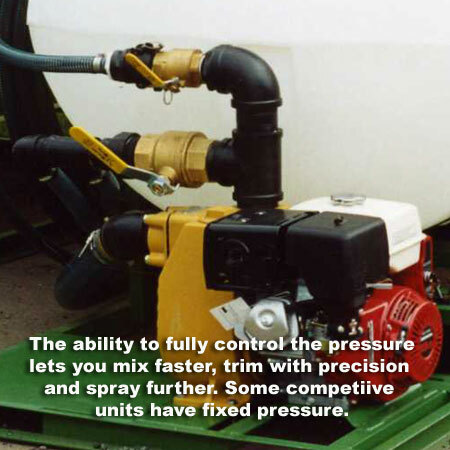 It features the most powerful pump you will find on any jet hydroseeder with 740 gallons per minute of flow and up to 87 PSI. This powerful 4″ pump that will mix some materials in less time than it takes you to close the lid. It has a powerful Bale buster that lets you add mulch in big chunks. 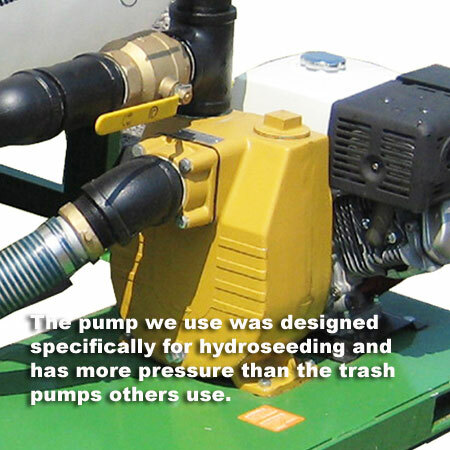 The 87 PSI pump was build from the ground up as a hydroseeding pump. It combines fast mixing, ease of use and great spray power. The great performance as won rave reviews with landscapers anyone with seeding to do. The HS-500-ZX is a high performance machine that will outperform units selling for twice the price. It will mix a load in seconds It will handle materials other jet agitated units can’t. The precision control makes this unit outstanding for close work and trimming. The high performance lets you seed large open areas quickly. 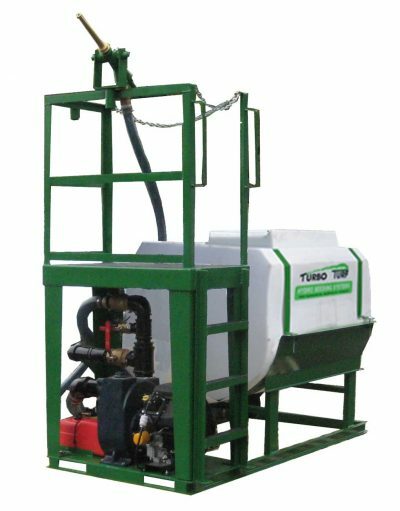 Equipped with the Big Kahuna option or platform gun it is easy to seed 2-3 acres a day if a good water source is available. 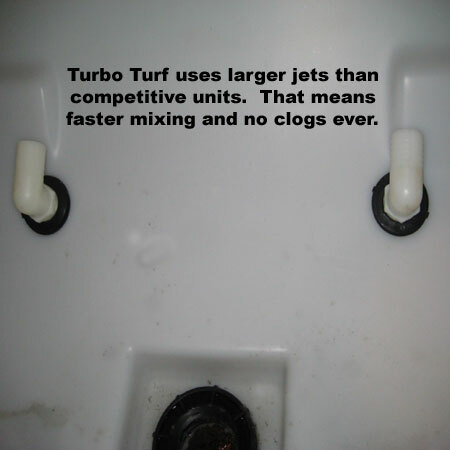 All Turbo Turf units feature easy clean up with a poly tank that can never rust. They are easy to use and require only one man to operate. 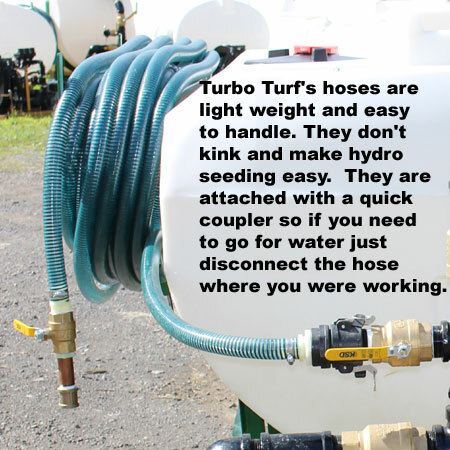 The pumps used by Turbo Turf were designed from the ground up for use in hydroseeding. They feature a combination of great pressure for spray distance and high volume for fast mixing. All passages are large and designed for smooth flow to virtually eliminate any potential clogging. Most owners tell us they never have clogs. 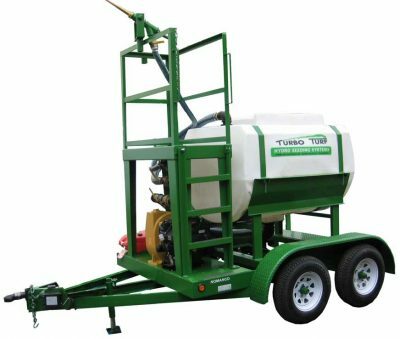 Turbo Turf’s HS-500-ZX comes with the front platform and tower gun as standard equipment along with 100 feet of large 1 1/2″ I.D. hose that allows you to seed large areas faster than competitive units. 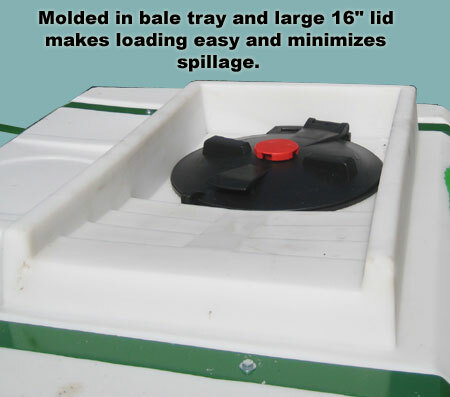 The molded in bale tray and large 16″ hinged lid makes loading material easy and minimizes spillage. There is a second 12″ lid that lets a second person help load or is convenient to add water without being in your way as you load. Front fork slots are built into the frame to make the HS-500-ZX easy to load onto a trailer or into the back of a truck. This unit comes with a 27 H.P. Kohler Command Pro electric start engine. This has proved to be a very reliable engine with a long life. The engine has a two year warranty and service for the engine is available at any authorized Kohler engine dealer. The HS-500-ZX-P is permanently attached to a DOT approved double axle trailer with brakes on both axles, DOT lighting, a breakaway, safety chains and an on-board test box for the breakaway battery. The trailer has a GVW of 7000 pounds and is 14’2″ long an 84″ wide. It is available with either a 2 5/16″ ball hitch or a pintle hitch.